The MINI Roadster is officially a concept at this stage but it looks to us like it’s ready to go straight into production. There’s nothing wild and wacky like the other concepts from the BMW group so we’d expect to see it on the roads within 2 years. The new MINI Roadster has an obvious familiarity to the original 50 year old MINI design and from the waist down it is much as the hatchback cars. The big change is the removal of the rear seats allowing the pop-up roll over bars to be moved forward behind the driver and the luggage space to be expanded. This means that there is space for a structural beam to run across the car behind the driver to stiffen up the chassis and improve handling over the more flexible MINI convertible. It looks good too. We think it is far prettier than the 2 seater coupe concept that was also launched at the Frankfurt show. The rear haunches look right in this car and it manages to look a bit more serious than the standard convertible. Power should come from the sportier of the MINI engines. 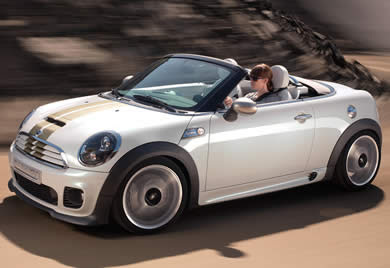 The 1.6-litre twin-scroll turbo from the Cooper S should be plenty to put a smile on your face. Performance may be increased a little over the four seater as there should be some weight savings but dynamically it is much the same car and although it may have a stiffer, sportier ride the power is still fed to the front wheels giving less controllable cornering than some other roadsters. It should still give great go-kart-like fun on twisty roads though. The roof is a small fabric affair which shouldn’t take up much of the cavernous 8.8 cubic feet of luggage space. 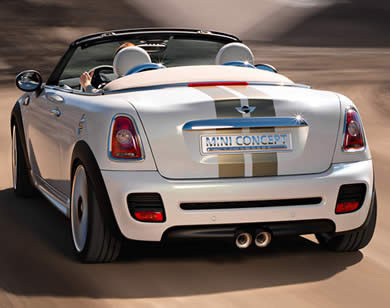 The soft top on the roadster opens and closes manually in a simple process taking only a few seconds thanks to the compact dimensions of the roof. 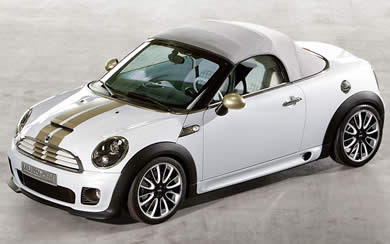 The decision not to give the car a power roof not only reduces the weight of the MINI Roadster Concept even further, but also adds to the puristic flair of the car. That looks a lot better than I thought it would. Hasn't it got the roof from a Porsche Boxster?